On June 28th 2016, Esthetician Ms. Megumi Hattori from Osaka, Japan traveled to Shizuka new york Day Spa to hear about the beauty industry in New York from Shizuka and also to experience our services. You can find a wonderful review about the interview with Shizuka and her experience of Renew-U spa package in her blog. It was one of the memorable day in my esthetic life. Details about the interview will be on “creabeaux” Beauty and Esthetic Magazine in Japan very soon! Do you know what is the No.1 cause of wrinkles? Aging? Smoking? Sun exposure? or Not moisturizing? According to WebMD, sun exposure is the No.1 cause! Using Sun Protection is the easiest way to protect your skin from sun light and prevent wrinkles. Shizuka new york’s Sensitive Skin Sun Protection is very light and smooth. This lightweight antioxidant moisturizer is a unique blend of botanicals that defend against overexposure. This sun protection from Shizuka new york has a nice natural scent that makes it easy to use it daily. Try Shizuka new york skincare system‘s moisturizer! This moisturizing cream is non-greasy, goes on silky smooth, and absorbs quickly leaving the skin looking radiant, healthy, and hydrated. It also aids in brightening hyperpigmentation and age spots on the skin. Hyaluronic Acid Gel is also good to keep your skin hydrated. Shizuka New York’s Hyaluronic Acid Gel is a unique formula comprised of Myristoyl hexapeptide-8. This fragment of human collagen works to improve and increase the rate of collagen production, thereby reducing fine lines and wrinkles. The water-based, oil-free, fragrance-free and non-comedogenic gel may be used under makeup and is appropriate for all skin types. Rose Geranium soothing mist is one of the popular travelling size products we carry from Naturopathica. One of the ingredient of this mist, Galactoarabinan is a natural polysaccharide extracted from previously harvested North America Larch Trees. It will help to reduce the appearance of fine lines and wrinkles, aids in moisturization and enhances skin radiance. Recent article of Quantas Travel Insider featured the Geisha Facial® as one of the unique spa treatments in the world! The spa, whose namesake is celebrity facialist Shizuka Bernstein, offers the Geisha Facial, in which sanitised, powdered nightingale droppings are applied to the skin to help exfoliate and brighten skin. We’re happy to have a writer from ELITE DAILY to experience The Geisha Facial®! She describes her honest feelings from how she felt before the facial, during the facial, and after the facial. Like everything else at Shizuka Day Spa, it was immaculate and beautiful. Plus, look at that cute orchid! Yes, we always have beautiful orchids! In the room, lounge, front desk, and more! After the Facial, she told us how it was. Peanut butter power bar. Don’t ask me why. It just did. I get a lot of blackheads on my nose, and I gotta tell you, they were gone after the facial. The bird poop was supposed to help clear my blackheads and, not gonna lie, it did. We’re glad to hear a real voice about The Geisha Facial® ! Shizuka answered questions in the article including how she started the facial, where the ingredients are coming from, and why the facial is good for your skin. New York is the trend setter of Gourmet, Fashion, Culture, and Beauty. 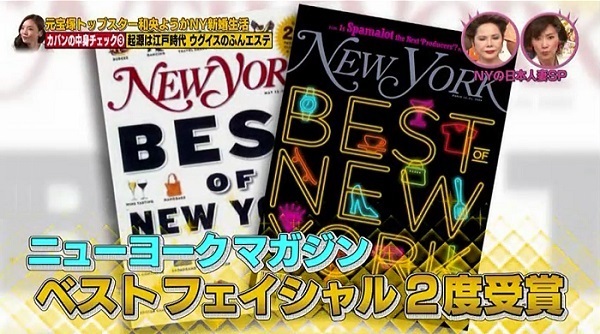 In the NY Beauty trend search of Japanese TV program King’s Brunch, The Geisha Facial ® was featured as a trending facial from New York! After Shizuka’s performance of the Geisha Facial®, she was so surprised by how clean her pores became! The Facial loved by celebrities might be imported back to Japan! ?